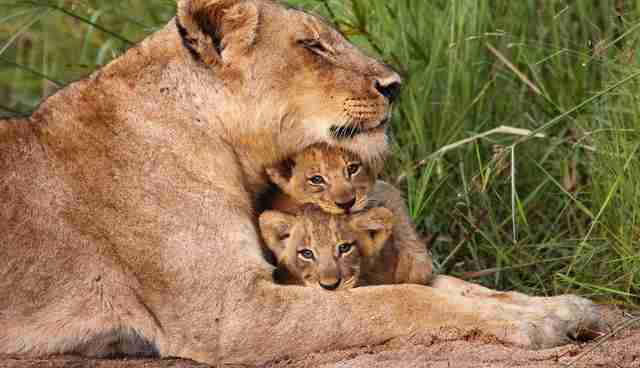 A lioness and her two cubs have been killed after a farmer complained that some of their pride ate his farm animals. Officials from the Mpumalanga Tourism and Parks Agency (MTPA) in South Africa waited by a carcass just outside Kruger National Park on Friday, according to Africa Geographic; then, when the pride returned, officials shot and killed the lioness and her cubs. The pride reportedly retreated back into South Africa's Kruger National Park, leaving the bodies of their loved ones behind. People are already asking questions about whether the lioness and her cubs really had to die. "I am sure they could have been tranquilized rather than killed," one commenter wrote on Facebook. "Why are we hearing about so many endangered animals being needlessly killed these days?" Another commenter wrote: "Why are they so eager to destroy these animals? What harm can the cubs do?" Experts weighed in on the event, which some are calling "horrific." "FOUR PAWS considers killing of three lions, which escaped from the Kruger National Park, as a horrific event," Claire LaFrance, of FOUR PAWS, told The Dodo. "It is a common practice that the animal keepers working in the sanctuaries and wildlife parks are equipped with the tranquilizers, so it is unclear for us, why the rangers of MTPA had to shoot the animals." LaFrance added that there is "an urgent need for better security standards" at zoos and animal parks. "FOUR PAWS recognizes that caring for wild animals in captivity always carries an element of risk that can never be completely eliminated, but it can be minimized by setting higher standards for animal and human safety," she said. The lions, who were killed on Friday night near the Phabeni Gate entrance to the park, are just the latest in a string of run-ins between lions and people. Usually the lions end up losing. In March, Mohawk the lion was killed by wildlife rangers after escaping Kenya's Nairobi National Park and injuring a bystander. The wildlife rangers had only bullets, no tranquilizers, with them. Shortly after, in April, authorities announced that Sylvester would have to be killed because he kept escaping South Africa's Karoo National Park. But public outcry forced them to reconsider. Instead, they moved him to into an enclosure in the park to keep him from escaping. "Safety should always be the top priority in zoos, sanctuaries and wildlife parks to prevent incidents like this in the future," LaFrance said. Over a century ago, there were 200,000 wild lions in Africa. Because of hunting and habitat loss, there are only about 20,000 wild lions left in Africa today. According to Africa Geographic, William Mabasa, a spokesman for the Kruger National Park, confirmed the lions came from the park, but that the park's rangers were not involved in the incident. The area where the lions were shot was outside the Kruger National Park's jurisdiction. The MTPA did not immediately reply to The Dodo's request for comment on why the lioness and her cubs were killed. Click here to learn what you can do to help lions in Africa.